3. Cold medicine - you know how some cold medicine (I'm talking about you Sudafed) can make you feel a little out of it? Maybe this happened to me, since I didn't eat anything with it. 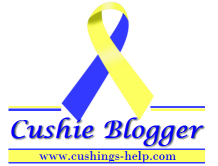 I know it's been a year or two since I've done 30 blog posts in 30 days for Cushing's Awareness. It's not possible for me to do 30 posts, but I will be posting a few special things throughout the month. Watch for the first one next week! I'm going to rest up for tomorrow. Below are some links to past Cushing's Awareness Challenge posts. Thanks for reading!